On April 17, 1340 a monk went to pray at the top of Mount Pochaev. Suddenly a column of fire appeared. Some pastors saw the monk and joined in prayer. When the flame had ceased they saw the Virgin on the mountain. When the apparition disappeared the imprint of his right foot had been embedded in the rock and a water fountain was born. The Mount of Pochaev, part of the Carpathians , is a place of natural beauty and for centuries has had many visitors and pilgrims. A monastery was established here in the thirteenth century. It is believed that the word Pochaev comes from an ancient Slavic word, charity. According to tradition, circa 1340 AD, one of the monks reached the summit of Mount Pochaev to pray, when suddenly a pillar of fire that was burning it. Calling the other monks to join him, stood in prayer. The fire was also seen by some shepherds were watching over their flocks in the area, including Ivan Bosoi ["bare"], which joined the monks in prayer. It was surrounded by flames and standing on a rock, the Holy Theotokos, the Mother of God. When the apparition finally disappeared, they saw that the place of the Theotokos had been melted, leaving the imprint of his right foot embedded in the rock. He appeared along the trail a spring of clear water. The first case would lead to many other supernatural events through the special presence of the Holy Virgin in this region. 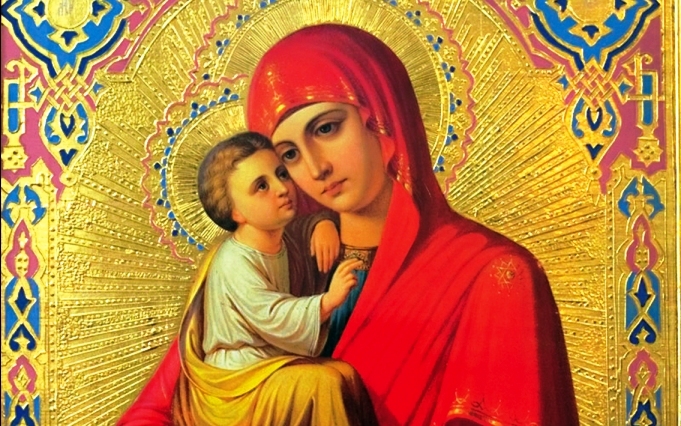 Many of these miracles are the result of the veneration of the icon of Our Lady of Pochaev. The icon arrived in the region as a corporate gift to Anna Goiskaya, an important patron of the Church in 1559. The miraculous icon character is introduced almost immediately, since only a short time later the blind brother of Anna regained her sight. After Anna's death in 1644 much of its goods were donated, including the icon to a Basilian Monastery nearby. After some legal obstacles are solved, the icon was finally placed in the sister of the Dormition of the Virgin Church. The chronicles of the monastery many miracles recorded on location icon there. Two of these miracles are very noticeable. The first took place in 1675, the Muslim Turks invaded the area and besieged the monastery. In response, the monks, along with people who sought refuge in the monastery, began singing the National Anthem before the icon Akathistos Pochaev, begging the assistance and protection of the Mother of God. To the amazement of the Turks, a vision appeared above Pochaev, he saw the Blessed Virgin, in a bright light, I accompanied St. Job. Lady put her radiant veil of protection over the monastery and was surrounded by a host of angels dressed for battle, with swords. The invaders tried to attack the angels throwing thousands of arrows into the air, but the arrows fell killing the men who shot them. The Turks raised the siege and fled in terror. The second miracle was remarkable during the construction of a large church in Pochaev in 1780. A monk ran to the church demanding that everyone leave. After about two hundred workers had left the church, the roof collapsed. In total, 139 miracles have been recorded in the chronicles of the monastery. The icon of the Mother of God of Pochaev is one of the most revered by Orthodox Christians, especially in Ukraine, Belarus, Russia and the Balkans. Pochaev permanently resident in the Monastery of the Dormition of the Theotokos, in southwestern Ukraine. The icon is widely known for healing the sick and other miracles. The image, made in tempera in Byzantine style, depicting the Mother of God wearing a crown who tenderly holds his head tilted to his Son, who is in his right hand. In his left hand, holding her veil, which covers the feet of the divine child. Jesus is shown giving his blessing to those for whom He is "the Way, the Truth and the Life." On both sides and bottom of the icon's thumbnail seven saints. On the right, the prophet Elijah and, below it, the martyr Menas, while the martyr Stephen and Venerable Avraamius on the left. In the bottom of the icon images are located Catherina the Great Martyr Irene and Parasceve and martyrs. This is a cute icon, Jesus and Mary have their faces in contact. Mary's face is described as "beautiful but sad". The icon is 29 x 23 cm and is made from red cypress tone. The origin of the icon remains a mystery. In 1869, the icon was covered with a golden metal, studded with precious and surrounded by a star-shaped framework stones, rays which are inlaid with pearls and diamonds. After an investigation, the icon was crowned by Pope Clement in 1773. However, in 1831 the Tsar Mykola gave the Orthodox monastery of monks, and drove the Basilian. In 2001, the icon was temporarily moved from Pochaev to the Chair of the Trinity (St. Daniel Monastery) in Moscow. The flow of the miracles of the icon continues to this day. To accommodate the many thousands of pilgrims come to pray Pochaev the Mother of God at the miraculous image. The Pochaev icon is carried in procession on festive feasts of the Nativity and Dormition of the Mother of God, and in the commemoration of the Blessed Virgin protect the monastery from the Turks in 1675. There are approximately 300 testimonies of miracles of the icon of the Mother of God of Pochaev. No written records of creation and the early history of the Monastery of Pochaev. According to historical tradition, however, the beautiful desert of the sub-Carpathians where the monastery is located was the withdrawal of several disciples of St. Methodius, evangelization of the Slavs [855 AD], towards the end of the ninth century. Several centuries later, during the Mongol invasion of Russia, two monks of the Monastery of the Caves of Kiev settled in the area after the Mongols had sacked their city. The early writings of monastic life on Mount Pochaev unofficial, are in the sixteenth century in documents of Polish kings Sigismund I and Sigismund II, which refer to "a Greek rite monastery on Mount Pochaev" and "very old and famous." It mentions the nobleman Orthodox Goiskaya Anna, the widow of a local judge, Goisky Basilio, and the life of St. Job of Pochaev venerable abbot of Pochaev from 1596 to 1651. In 1559, when at the request of the Greek Patriarch Metropolitan Neophite came to Russia in search of financial support for the Church of Constantinople, brought with him an ancient Byzantine icon of the Mother of God. From his home he traveled to Moscow Volhyn, where he accepted the invitation of Anna Goiskaya to enjoy his hospitality in his castle in Orel, not far from Pochaev. In gratitude for his generosity as a blessing to Anna, left him the icon he had brought from Constantinople. Anna made the first icon in his private chapel, where he remained for more than thirty years. During those years, officials began to notice that sometimes shone the icon with a mysterious light, and had begun to manifest miracles. Anna herself was prone to believe in the stories of his service until he saw the light icon emanating a radiant light. In 1597, Anna gave Goiskaya the miraculous icon as a gift to Pochaev Monastery Monastery, now headed by the venerable abbot of St. Job, in addition to land and support materials. Already with the icon in the holy house, under the guidance of St. Job was erected a stone church in honor of the Dormition of the Theotokos, the same Goiskaya richly furnished with all necessary materials. After the death of Anna Goiskaya, his heir, a nephew in the Reformation had converted to Lutheranism, sacked the monastery and took Pochaev icon. Expressing his contempt for the holy image, and Orthodox services involved, his wife shouted insults to the icon. Therefore, he was severely punished by a demonic torment. The suffering of the poor woman only stopped when she finally returned the sacred image to its rightful place in the monastery. During almost 100 years in the 18th century and early 19th centuries [1721-1831], the Pochaev Monastery was in the hands of Greek Catholics. During that time, the majestic triple altar of the Cathedral of the Dormition was built, [1771-1783] was built on behalf of Nicholas Potocki, and the icon was moved there in 1791. In 1831 the Monastery Pochaev turned back to Orthodox Christians. Two years later, the Holy Synod of the Russian Orthodox Church monastery high in the category of "Sanctuary", equating religious stature with Kiev Caves, the Holy Trinity and St. Sergius, near Moscow, in particular, St. Alexander Nevsky in St. Petersburg, whose traditions of singing and reading were adopted in Pochaev.